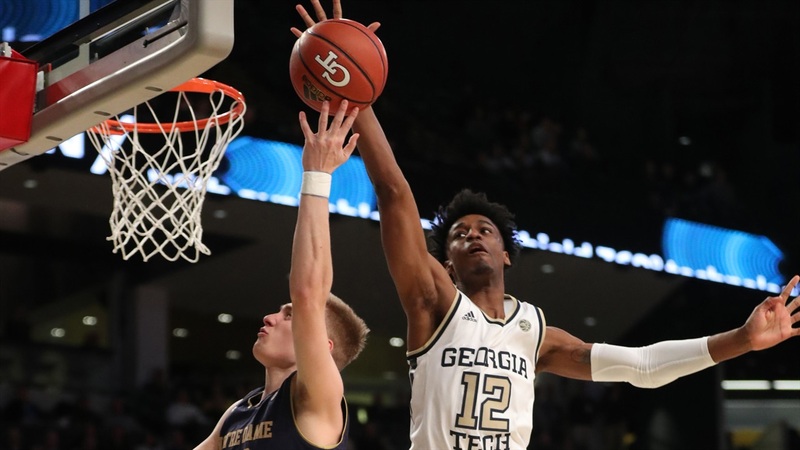 Earlier in the week, Notre Dame head coach Mike Brey talked about the need to shoot the ball better, so he had to be frustrated to see his Irish miss eight of their first nine shots and 17 of their first 21 on Tuesday night at Georgia Tech. The Irish did fight back to keep the game close until John Mooney – with some help from Nate Laszewski – got the offense going. Notre Dame even grabbed the lead heading into halftime. Unfortunately, the Irish were never able to get completely back on track shooting the ball and lost 63-61. Notre Dame drops to 11-8 overall and 1-5 in the ACC while Georgia Tech improves to 11-8 overall and 3-3 in the league. Georgia Tech took its largest lead of the night of 11 with five minutes to play. Notre Dame battled back to cut it to two with a couple minutes to go, but was never able to get over the hump. Laszewski drained a three-pointer and made three free throws after getting fouled shooting a trifecta with 2:45 left to make the score 59-57. After a Georgia Tech bucket, TJ Gibbs made a pair of free throws to trim the lead back to two with 10 seconds left, but Jose Alvarado made two free throws to seal it with eight seconds to play. Mooney made a jumper at the buzzer to account for the final score. Mooney finished with a game-high 22 points and 14 rebounds. Laszewski had a career-high 19 points, making four of nine three-pointers. Unfortunately, the rest of the Irish shot just 3-for-21 from beyond the arc. Alvarado and James Banks III each scored 16 to lead the Yellow Jackets. Brey was called for a technical with seven minutes to play following a foul call on the Irish. Alvarado made the two free throws and Michael Devoe converted a drive on the same possession to put the Yellow Jackets up 51-44 with just over seven minutes to play. Gibbs responded with a three-pointer on the next possession, but that didn’t flip the momentum. Khalid Moore put in a shot off the glass on a scramble as the shot clock expired before Alvarado swished a three and Moore converted a layup to give the Yellow Jackets the 11-point lead, 58-47, with five minutes to play. Notre Dame shot 32.3 percent from the field (21-65) while the Yellow Jackets were 46.1 percent (24-52). In the first half, the Yellow Jackets jumped out to a 13-4 lead before the Irish offense got a putback from Mooney and a three from Nik Djogo to cut the lead to four. Georgia Tech pushed its lead to seven, 23-16, but back-to-back threes from Laszewski trimmed that lead to one. A three from Devoe put the lead back to two, but a pair of putbacks from Mooney sandwiched around a Georgia Tech dunk tied the game 28-28 with 2:35 left in the half. The offensive rebounds and buckets gave Mooney his 11th double-double of the season and fifth straight in ACC. A pair of free throws from Mooney in the final minute gave the Irish their first lead of the night at 30-28, which they would take into the locker room at halftime. Mooney had 14 points and 10 boards in the first half while Laszewski had eight. Banks and Alvarado led the Yellow Jackets with eight and seven respectively. Notre Dame finished the first half just 31.4 percent from the field (11-35) while Georgia Tech shot 40.7 percent (11-28), but the Irish had 11 offensive rebounds to just four for the Yellow Jackets. Next up for the Irish is a home contest against #3 Virginia at 1 p.m. on Saturday.